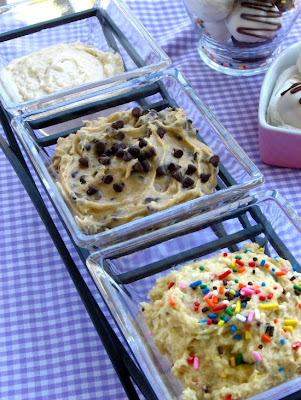 Shannon's Funfetti Cake Batter Dip is one of our post popular posts ever (her coconut oil hair treatment is getting pretty popular now too) - its not surprising, who wouldn't want to eat cake batter as a treat? Since we live a couple states apart, I never got to try it. 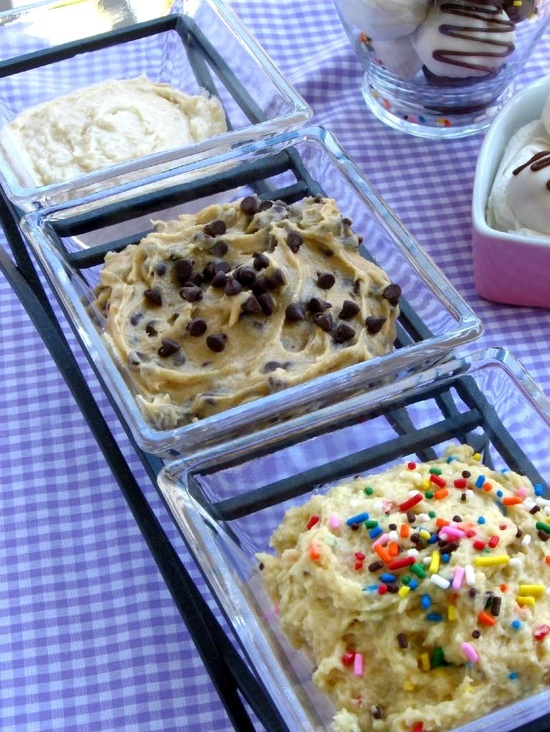 I came across this pin from Willow Bird Baking awhile back and figured I would get to try a cake batter dip and a couple others as well. The annual Wine and Cheese Christmas Party I have with my girlfriends every January seemed like the perfect time to try them out. You may remember last year I made these chocolate gooey butter cookies for the same party. I started with the chocolate chip cookie dough dip. After I creamed the butter and sugar together, I added the dry ingredients. It was super powdery and I was afraid I was off to a bad start. But after what I think was 4 tablespoons of water (added one at a time), I got a nice consistency. I made it a littler runnier than what cookie dough should be in hopes that it would be easier to dip. Here they are all together. I had the perfect three-slot dish I use for my Christmas dinner mashed potato and sweet potato bar fixings. Don't they look delicious?? When I was at the store grabbing the funfetti cake mix, I picked up some chocolate teddy grahams, pretzels, and vanilla wafers as dippers. The Verdict: They were absolutely delicious and possibly addicting. I heard a lot of "they remind me of dunkaroos" which just brought me back to middle school. I am not the only one who would take the tiniest amount of frosting with each cracker and then on the last one take the entire scoop of the frosting that was left, am I? 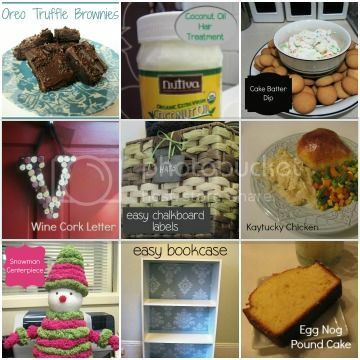 Things to consider: They were a little more work than Shannon's first post, but still pretty easy. With the exception of the cake batter dip, I had everything else I needed in my pantry. They were a bit on the hard side for dipping (I had them in the fridge after I made them but thought they would thaw out a bit on my drive to Hoboken). I was afraid the sugar cookie and funfetti doughs would taste too similar, but they had two distinct tastes. Also, each batch made a little less than double what you see here. What I couldn't fit got sent to my cousin Claire's new house on her move in day (remember her Now-and-Later Cookies housewarming gift?) for her and her helpers. All in all, I will definitely be making these again, maybe for a future book club. As always, the party was a fun time. Thanks for hosting Mary Claire! I thought I was slick by "stealing" a gift this year but joke was on me, it was stolen from me too. I had a brand new silpat mat (side note: anyone have any experience with those? should I invest in one?) and cupcake carrier in my hands before it was taken. I wound up with a great gift in the end: a bottle of prosecco, a gift certificate for a great restaurant, and an excuse to go back to Hoboken for brunch! In a medium bowl, cream together the butter and sugar. Stir in the flour, salt, vanilla and chocolate chips. Add water one tablespoon at a time (stirring between each) until the dough reaches cookie dough consistency. In a medium bowl, cream together butter and sugar for 2-3 minutes until light, fluffy, and pale yellow. Mix in flour and vanilla. Add water one tablespoon at a time, mixing after each, until you reach cookie dough consistency. In a medium bowl, cream together butter and sugar for 2-3 minutes until light, fluffy, and pale yellow. Mix in salt, flour, cake mix, sprinkles, and vanilla. 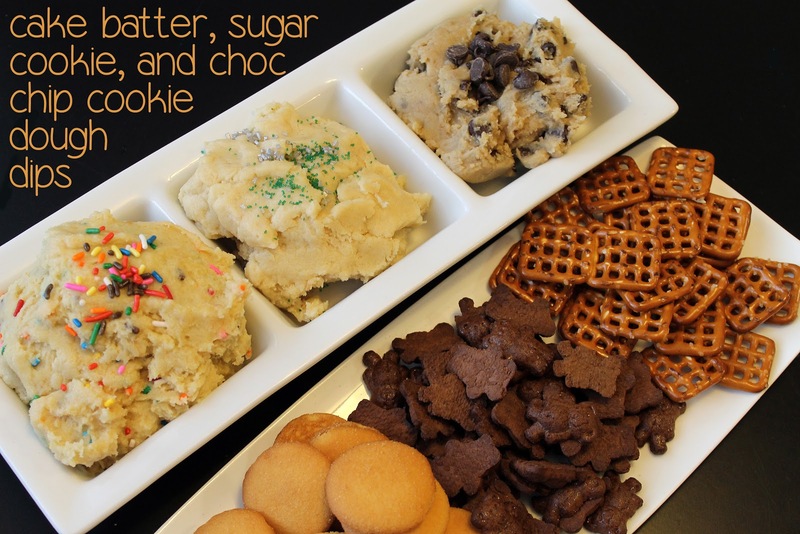 Add water one tablespoon at a time, mixing after each, until you reach cookie dough consistency. *Julie does use the following disclaimer which I guess I should repeat. Clearly, though, I was not concerned: "Note: Since posting this recipe, scientisty types have also found that raw flour — just like produce — can carry E.coli if it’s been contaminated with it. This article suggests that the risk is even smaller than the tiny risk of getting Salmonella from eating cookie dough with raw eggs, but it’s still there and I wanted you to know about it. "